. Knit So Simple: it's been a LOOOONG week . . Remember this swatch? 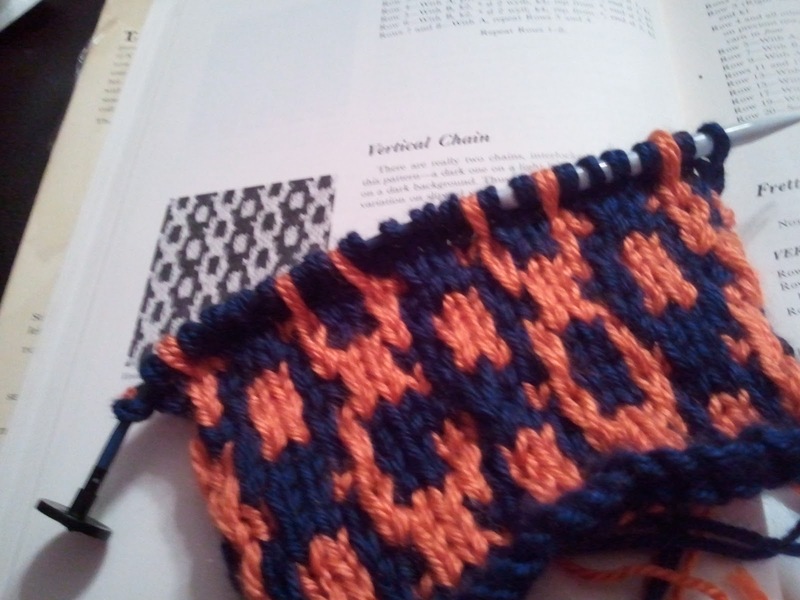 I had grand plans for this little Auburn scarf . . using a great pattern from my Barbara Walker Treasury of Knitting, Volume 2. However, the more i worked on it this weekend the more it curled on itself . . and despite the fact that i wanted it NOT to curl, IT DID! SO.... i ripped it out! Several times . . . during those 36 hour days . . .
and FINALLY surrendered to my Crochet Hook! i chained 270+ stitches and started this fun little crochet version of the Feather and Fan pattern . . and it is flying now! I am liking the curls and ripples and will probably attach some fun little dangly circles at the end just to finish the cute! Needless to say, i should have had this one completed before i left the school at 1 AM Sunday morning ... but . 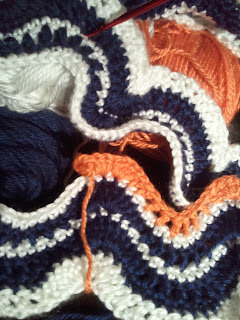 . .
and in the midst of my Auburn dilemma i had this floating around for a March Scarf! 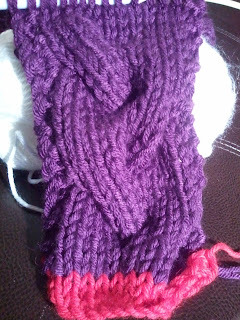 i LOVE cables .. . . and had this wonderfully soft yarn from Deborah Norville in a rich grape worsted weight ... i'm doubling it and using a size 11 needle .. and am planning on making it an eternity ring scarf . . at least right now, that's the plan. But i clearly have learned this past week that not everything works out like you had intended! and when i realize that i also have big plans for God rather than acquiescing to His Plans for me . . . i find that He, on most days, is probably spending time rewinding me .... casting me onto His needles again .... separating all the planned entanglement i get myself into because i have yet to fully comprehend (and therefore TRUST) that His ways are NOT my ways ... that His plans are not my plans . . yet! I have failed to grasp how desperately He truly LOVES me ... and longs for my very BEST . . . He has to re-do . . not because His plans failed to work ... but because i continue to force my will onto His .. and He is a gracious God and is willing to wait until i seek His face ... call upon His name before He will step in and gently clean up ... rip out ... start over, using His pattern!